When I was seventeen, I was a freshman in college. When I was thirty four, I was working at a small museum in NYC, living with but not engaged to my now husband. Now I'm fifty one, and according to my eight year old, the oldest mother of a third grader in history. While having a between-Christmas-and-New-Years birthday is sometimes not all it should be, what with the "here's your Christmas/birthday present", I've done a pretty good job of training my nearest and dearest, and my mother always did right by me. In fact, given that her due date was 12/25, the best present ever might have been that she waited a few days so I wasn’t a Christmas baby. There are other good things: the time of year being what it is, I never had school on my birthday, and I think I've had to work it only once or twice. Generally, it's like today - nothing to do, no work, no school, no obligations - just a mid-winter holiday all my own. I have rules about my birthday. If you give me a present on Christmas Day, I will put it aside until today. The book of Edward Gorey's letters - a book I did not know existed, but was a perfect gift for more reasons than I can enumerate - came from my sister-in-law, and has been waiting on a shelf since the week before Christmas. My in-laws brought presents on Christmas Day; they went on the same shelf. My brother and his wife mailed the presents I accidentally left behind after our Christmas Eve celebration - and now that I think about it, the leaving behind may have been a subconscious move, though I didn't mean for them to have had to go to the expense and hassle of posting the box to me. The internet has made my life richer in many ways, filling my Facebook wall and Twitter stream with birthday wishes. The doorbell rang with a bouquet of flowers from the lovely Brand About Town women, who have made me irrationally fond of all Nintendo products just because they are such stellar cultivators. And UPS just delivered a book, from Sarah, my sister from another mother - whom I'd never have met but for our blogs. Can I be a little verklempt? I am. I couldn't have wished for a better birthday. May your stockings be filled with your heart's desires, and your table be surrounded by love. It started with three stockings. One for my mother, one for my father, one for me. Mine was white, with an angel in a blue dress. Yellow yarn hair, a gold halo, stars at her feet, organdy wings. My mother’s was white too, an assortment of pastel ornaments appliqued on. My father’s was red; his was the Christmas tree, complete with tiny real glass ornaments, the size of a marble. She’d made them all, my mother did. Crafted of love and felt, they had stars and paillettes sewn on with tiny glass beads at the center, bits of lace and ribbon, an occasional jingle bell. When my brother was born, she made him a stocking: red felt with a snowman. The snowman was gently padded underneath, and he wore a miniature hand knit blue and white Yale scarf. My sister completed the family, and her stocking was green with a red dressed Santa, fat belly encircled by a tiny vinyl belt. For years, those five stockings were the ones carefully hung from the mantel each year. One year, I made a tiny inept stocking for a cat, blanket stitched ‘round the perimeter; when my parents divorced, the Christmas tree stocking was put away, not to be spoken of. 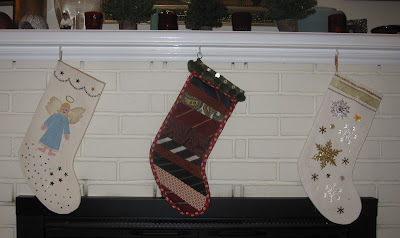 Gradually, more stockings were added to the mix – one for my husband, that I made, patchworked from old silk ties. My mother made stockings for my sister’s husband, her two older children, my daughter, my brother’s husband WIFE. We ran out of cup hooks on the mantel and started doubling up. My mother made a stocking for my sister’s youngest child – but didn't realize it was backwards, its toe pointing southwest, until she brought it down to the dining room where it hung in merry opposition to each and every other stocking. A couple of store bought stockings could be rotated in for house guests, like David, our brother from another planet, who came for Christmas Eve one year, and left two days later (and came back every year thereafter). There were rules about the stockings: nothing was to be put into them until Christmas morning, nothing too heavy, contents were to be gently dumped onto the table and stockings returned immediately to their cuphooks, there must be no handling of the felt with sticky fingers. But, you see, they were worthy of rules, needing of protection. They're art, you see, art shot through with love and magic. After we’d moved into our house, with our very own mantel, we had stand-in stockings – attractive enough Hable stockings I’d bought on sale – because the “real” stockings still resided at my mother’s house. It was only this year that I brought home the angel, and the ties, and the stars, and hung them with care on our very own cup hooks. Now, our house is really a home. My mother loved doing Christmas. Her Christmas was an exuberant but tasteful echt-Victorian tree and ornaments and swags and lights and candles and ribbons and cookies and stockings hung by the chimney with care. She was an expert wrapper, with a deep frugal streak – wrapping paper was carefully recycled (really, you’d never have known), ribbons were put away for use another year, and tags were sorted by name, a shoebox per child. She made the tags, of ends of ribbon, bits cut from Christmas cards, a mylar floof, a flocked holly leaf. Sometimes, even, the tags stayed attached to frilly gold elastic “ribbons”, to be slipped around just the right sized package the next year. I have a box of her tags. A gold gift box from Lord & Taylor, from the days when department stores put scarves and blouses in real boxes, it’s a jumble of tags, new and old. Some have been around since I was a child (or so it seems). Others are more recent; there are tags that my mother made for my husband and daughter. My wrapping tends to the more pedestrian. I hate the waste of buying paper, preferring to salvage crinkly brown paper and newsprint and ivory tissue and even a seed catalog with an old-fashioned feel. And I’ve given up on ribbons, in favor of Japanese masking tape, patterns of red and green – loving its duality as both decoration and adhesive. A couple of weeks ago, I read a book review of a book I just had to have. I mean, I was drooling over the excerpt I downloaded to my Kindle (well, the Kindle app on my iPad if you want to split hairs), but it was the kind of book that I wanted to have and to hold, to dog-ear and splatter-stain. So in a little fit of I-deserve-this, I bought it for myself for Christmas. I figured I’d wrap it up and stuff it under the Christmas tree, to me, love me. Last night was wrapping night. I sequestered myself in the cellar and set to work. Wrap, wrap, wrap. Check it off the list. Put it in the box. Wrap, wrap, wrap some more. I came to the book I’d bought myself. I wrapped it in Santa paper. My eye fell on the gold box of my mother’s tags. Half wistfully, half mischievously, I fished out a tag and snapped it round the book. Done. It is truly one of the most peculiar things I’ve ever done, and yet, it was just right. I can’t wait to open it. A couple of days ago, I decided we should have a Christmas party today. The first version of the email I sent out failed to include our address, which is what happens when you write emails on the spur of the moment in the middle of the night. But, later on, a bunch of people will show up for wine and cheese, selzer and cookies, and a random selection of some of the many holiday songs in my iTunes library. My husband constructed complicated smoked salmon canapés, and piped deviled eggs. He made my mother's chicken liver paté. I stuffed celery with a smear of blue cheese/cream cheese - an hors d'oeuvre that my grandmother always always served. There will be two kinds of popcorn - savory (dill pickle) and sweet (caramel). The cheese is from Murray's, the apple cider is from the farmer's market, my father caught the salmon (though someone else smoked it). And we bought a box of pigs in blankets, you know, for the children. I wish you all could come. Y'all know that I have a lot of Christmas music, right? As of this morning, there are 1445 tracks tagged holiday in my iTunes library, representing 3.2 DAYS worth of non-stop merriment. A small handful of those might more properly be called New Year's music or Hanukah music; I just call it all Christmas music and be done with it. I'm (small-c) catholic that way. Or maybe just (capital-a) Atheist. Of those 1445 tracks, 24 of them are versions of The Little Drummer Boy. I know. Pah tum puh pum pum. Let me tell you that I lose over and over again, because despite the fact that The Little Drummer Boy represents less than 2% of the tracks in that Christmas playlist, it seems to be in rotation all the pa rum puh pum time. However, our Christmas lights do not flash in time to the pa rum puh pum pum. 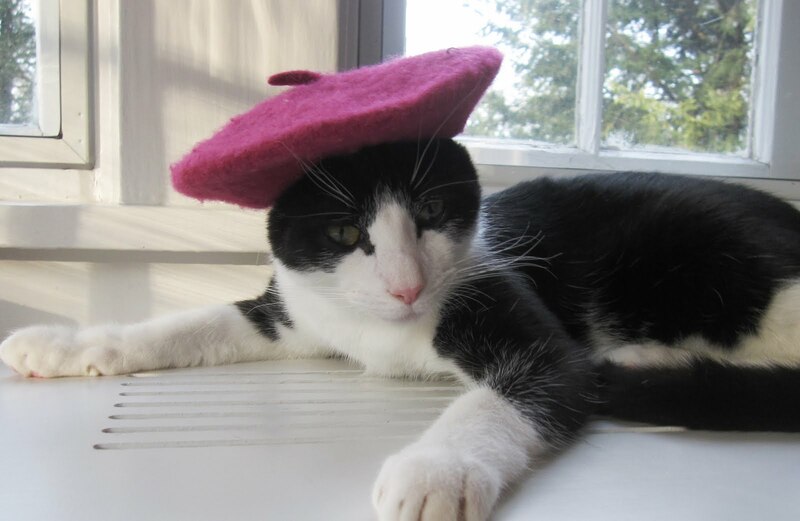 Actually it's one cat in two different hats, which is what happens when you're the docile cat and your eight year old owner has commandeered the camera. Most nights, I find myself lying beside my daughter at her bedtime, soothing her to sleep. For, though she's a third grader, an eight year old, she still falls asleep best if she's snuggled right up next to me. Sometimes it takes longer than it should, and though I'm not allowed to turn on the light and read a book, she's unconcerned if I pick up my iPad and browse through email or Twitter or Google Reader or Facebook. And then she's asleep and I go back downstairs to pay bills or wrap Christmas presents or rearrange the dishes in the dishwasher. Last night, I read two posts in a row, by two different people (as opposed to two posts by the same person), and was struck by an underlying similarity, and I thought "Emily should meet Julia; Julia needs to meet Emily". They're both very wise parents. I have slowly come to accept that, work though I might, I’ll never understand how their amazing, remarkable brains work. The depths are for them to plumb alone. All I can do is hum along for the ride. I inhaled sharply and let the thought sink in. I felt the overwhelming weight and piercing pain of it. And then I felt the freedom of it, too: It's not up to me. It is not up to me. For better or worse, the size of the problem was bigger than I could solve. I had to own the part I could own, and let go of the (bigger) part that I could not. And as I grasped this the train came in. You can give them your love but not your thoughts. For their souls dwell in a place of tomorrow, which you cannot visit, not even in your dreams. You can strive to be like them, but you cannot make them just like you. And really, without being too cloyingly maudlin or anything, isn't that just it? We can pat their backs as they fall asleep and help them learn long division and teach them to boil an egg, but they have their own thoughts and will do what they will. A couple of years ago, we got the girl a dollhouse for Christmas. She hardly ever plays with it, because it's too big for the Calico Critters and too small for the Barbies - creative make-believe be damned. Yet, when I asked her if we should get rid of it - it does take up a lot of space in her small bedroom - she told me that she didn't want to because she didn't want to hurt Santa's feelings. She's been writing letters to Santa Claus since September, one all Calico Critters and accoutrements, the next a list of American Girl Dolls and accessories. The current envelope addressed to Santa includes a lot of slips of paper cut from the myriad advertising supplements that arrived with the Sunday paper. The other day, she asked me, carefully, nonchalantly, do you think Santa is real? I parried with a what do you think? I asked her to reflect on what happens at the end of The Polar Express (which we'd read the night before). At one time, most of my friends could hear the bell, but as years passed, it fell silent for all of them. Even Sarah found one Christmas that she could no longer hear its sweet sound. Though I’ve grown old, the bell still rings for me as if does for all who truly believe. Your Honor, every one of these letters is addressed to Santa Claus. The Post Office has delivered them. Therefore the Post Office Department, a branch of the Federal Governent, recognizes this man Kris Kringle to be the one and only Santa Claus. Today, she still believes in Santa Claus. But I know that there's doubt in her young heart, and that rather makes me sad. Third grade field trip to the water treatment plant. The girl vectored upstairs to get dressed; we stayed behind nursing our cups of coffee and reading some more bits of the paper, as we do. 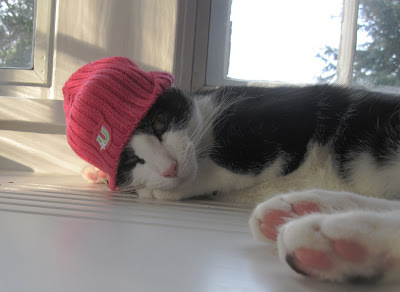 About 15 minutes later, she came back downstairs, and paused in the doorway of the dining room looking stricken. I assumed that the cats had destroyed something special (as opposed to their ordinary mischief), or pooped somewhere untoward; it was that sort of look. What's wrong, honey? She dissolved into sobbing wailing hysterics: I'm worried about the planet and all the water going away. While I thought she'd been totally absorbed in $900 television sets and iPod karaoke machines and Barbie dollhouses, she'd been hearing Daddy talking about the Earth's water boiling away several billion years from now. We calmed her down, explained that several billion years was Several Billion Years and not, like, tomorrow. In school, they've been studying water and the water cycle - it's part of why last month's field trip was to the local water treatment plant. And what she's learned is that the water cycle is endlessly recurring: Evaporation, Condensation, Precipitation, Accumulation, Evaporation, Condensation, Precipitation, Accumulation, repeat. For her to hear that the Earth's water might boil away was not only horrible news, but a questioning of the supreme authority of her teacher. I hope her teacher wasn't too taken aback when she was ambushed at this morning's Morning Meeting. This weekend, I learned that the we aren't going to be able to live on Earth in several billion years. At least she asked for a copy of the article to bring to school today. But I tell you, an eight year old having an existential crisis at 8 in the morning is not a pretty sight.